The TIMOTHEO LT system has been designed for the automatic filling of sterile vials with radiopharmaceuticals, without piercing the vial plugs. The machine is able to open the sterile vials, then fill, cap and crimp them. 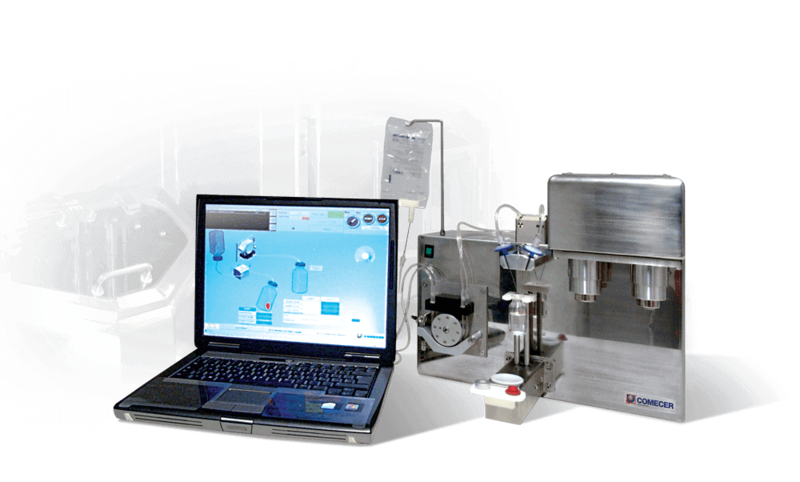 The system is housed inside a Comecer cell model BBS-T or BBST-PC with laminar flow (Class A), equipped with dose calibrator, pre-chamber and tele-plier; this combination ensures the compliance of the production with GMP regulations. 4 working stations: one for removing and putting back the aluminium ring and the rubber cap and one for crimping and decrimping. 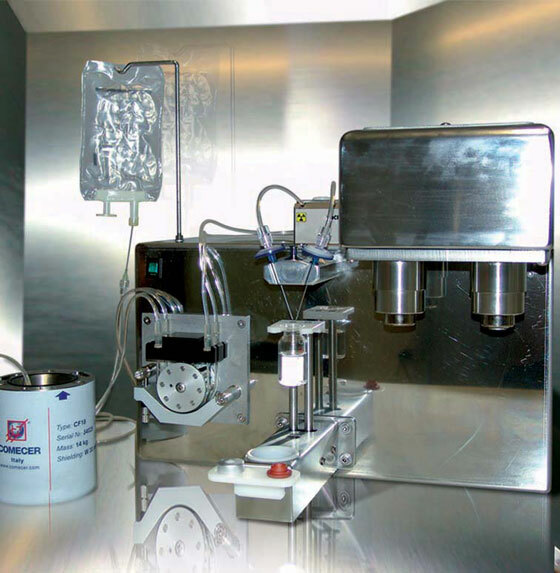 1 electronic weighing system which accurately determines the quantity of the liquid transferred inside the vial. 1 peristaltic pump able to fill the vials with great accuracy and repeatability. The pump manages two disposable lines, one for the radiopharmaceutical and one for the physiological solution (the total internal tube volume is less than 0.1 ml for dead volume reduction). 1 two-channel pinch valve which regulates the filling process. 1 pneumatic elevator (inside the BBS-T Hot Cell). 1 supervisory system that uses a PLC for machine control and a PC for the operator interface. the calculation of the required activity of the radiopharmaceutical at the prescribed injection time, entered by the operator.